This pattern and color combination reminds me of a tapestry I hung on my dorm room ceiling sophomore year in college. It was a bedspread I got from Urban Outfitters, and it's truly stunning. The damask pattern is silver, and the material is a sheer white. I hung it right below a light, so the light dimmed down and spread out throughout my entire room. Man that was a good room. For the base of this, I used French White Creme (Wet n' Wild) and stamped with Passion (China Glaze). I realize I used that color last night, but the color was so striking I wanted to use it again. (I have a feeling it'll be one of those bottles I'll need 2 of.) The plate is RA-109, from the increasingly popular Red Angel line. I remember when I first bought the set in November, there was one or two reviews. Now there are 109 reviews, and I'd like to think I'm a part of that. I hadn't seen the set used on any of the blogs I followed, so I took a risk at $12.99 and wound up with one of the best sets out there. Have you bought your set yet? How pretty! I just bought a pencil holder that looks just like this! Passion really is a lovely color. This looks beautiful! This is so elegant and subtle. It makes me think of having tea with the queen! Lol! I have to try something similar. 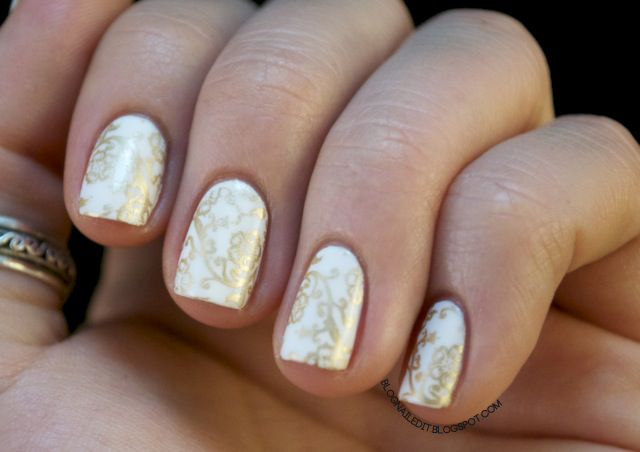 It doesn't look too much unlike other full nail designs stamped on all nails. Thanks for sharing. Unfortunately, these are not sold internationally. This is beautiful! It would be awesome for a wedding, even for the bride! Nice job!! I just got mine in the mail a couple of days ago. Love them!